Copy-number variations (CNVs) are structural variations in the genome involving 1 kb to 3 mb of DNA. CNV has been reported within intron 1 of the BMPR2 gene. We propose that CNV could affect phenotype in familial and/or sporadic pulmonary arterial hypertension (PAH) by altering gene expression. 97 human DNA samples were obtained which included 24 patients with familial PAH, 18 obligate carriers (BMPR2 mutation positive), 20 sporadic PAH patients, and 35 controls. Two sets of primers were designed within the CNV, and two sets of control primers were designed outside the CNV. Quantitative PCR was performed to quantify genomic copies of CNV and control sequences. A CNV in BMPR2 was present in one African American negative control subject. We conclude that the CNV in intron 1 in BMPR2 is unlikely to play a role in the pathogenesis of either familial or sporadic PAH. Pulmonary arterial hypertension is a progressive disease characterized by obstruction of pre-capillary pulmonary arteries. Symptoms of PAH include fatigue and shortness of breath. Sustained pulmonary arterial hypertension eventually leads to right-sided heart failure and death. In 2000, mutations in BMPR2 (bone morphogenic protein receptor type 2) located on chromosome 2 were shown to cause familial PAH. The BMPR2 gene spans 190 kb but encodes only a 4 kb transcript. It contains 13 exons and a large first intron composed of over 90 kb with frequent repetitive sequences. BMPR2 mutations are present in over 80% of patients diagnosed with familial PAH and are responsible for some cases of idiopathic PAH. Although the discovery of the BMPR2 mutation has enhanced our understanding of PAH, there are several important characteristics of the disease which remain unexplained. For example, the lifetime risk of developing PAH with the BMPR2 mutation is less than 20%, anticipation is observed, and there are both familial and sporadic patients without the BMPR2 mutation who develop PAH. Recently, penetrance has been linked to levels of BMPR2; unaffected carriers (patients with a BMPR2 mutation who do not have PAH) have higher levels of wild-type BMPR2 allele transcript than patients with BMPR2 mutations and PAH. This finding suggests that alterations of gene expression may be relevant to PAH phenotype. CNVs contribute to genetic variation through insertion, deletion, or inversion of DNA. Examples of diseases in which CNV participates mechanistically include DiGeorge syndrome, Angelman syndrome, Alzheimer's, autism, and schizophrenia. Cystic fibrosis is an example of a pulmonary disease where CNV modulates gene expression. In transgenic mice, deletion of DNase I hypersensitive site in intron 1 did not change CFTR (cystic fibrosis transmembrane conductance regulator) expression in the lung, but it decreased expression of CFTR in the intestine by about 60%. Therefore, CNV in intron 1 in the CFTR gene acts as a regulatory element and is required for normal CFTR expression in the intestinal epithelium. Recent advancements in array technology have allowed investigators to perform genome-wide assessments of genetic variation. To date, there are well over twenty thousand CNVs listed in the Database of Genomic Variants. The Database of Genomic Variants lists seven partially overlapping CNVs within intron 1 of BMPR2 on chromosome 2 consisting of a deletion of a several kilobase region. Since intron 1 can contain regulatory elements, as demonstrated in cystic fibrosis, CNV in intron 1 of BMPR2 may be an important modifier in PAH. We propose that CNV in intron 1 of BMPR2 could affect penetrance, anticipation, or disease phenotype in familial and/or sporadic PAH. The Database of Genomic Variants was queried for CNV within the BMPR2 gene. The database identified seven CNVs in intron 1 at locus 2q33.1: 202,992,448 – 203,030,002. The CNVs were partially overlapping, but had different endpoints (Figure 1). They were discovered using a variety of methodologies [6–12]. All seven CNV studies used samples from the International HapMap Project which includes individuals of European, Yoruba, Chinese, and Japanese ancestry. CNV and primer set location in the BMPR2 genome. We designed two sets of primers within the overlapping CNV region: CNV set 1 (GCATTGAAAGTGGGATAATGG, TGAAATTTGAGGATAACAATTTTAAG) and CNV set 2 (TAATTGCCTTCAGAGCAGGG, CCAACATTTGTCAAGGATGC). We designed two sets of control primers outside the CNV (one control primer set was placed within exon 1 of BMPR2 and the other control primer set was placed within exon 1 of BMPR1a): CNV set 1 (TTGTGATTCGCTCACAGGAG, AGAGGCTGCCCCTTCTAGTC) and CNV set 2 (TGGTAAAGGCCGATATGGAG, ATGTTTTCATGGCGCATTAG) (Figure 1). Human genomic DNA was obtained with informed consent from 97 patients with approval from the Institutional Review Board at Vanderbilt University. Genomic DNA was isolated from whole blood using the Roche MagNA Pure LC DNA purification system (Roche Molecular Biochemicals, Indianapolis, IN). Of the 97 samples, there were 24 patients with familial PAH, 18 obligate carriers (BMPR2 mutation positive), 20 sporadic PAH patients, and 35 controls. Obligate carriers are patients without pulmonary hypertension, but with BMPR2 mutations. Controls were either married-in spouses (7), unaffected family members negative for the BMPR2 mutation (13), or unrelated healthy individuals (14). 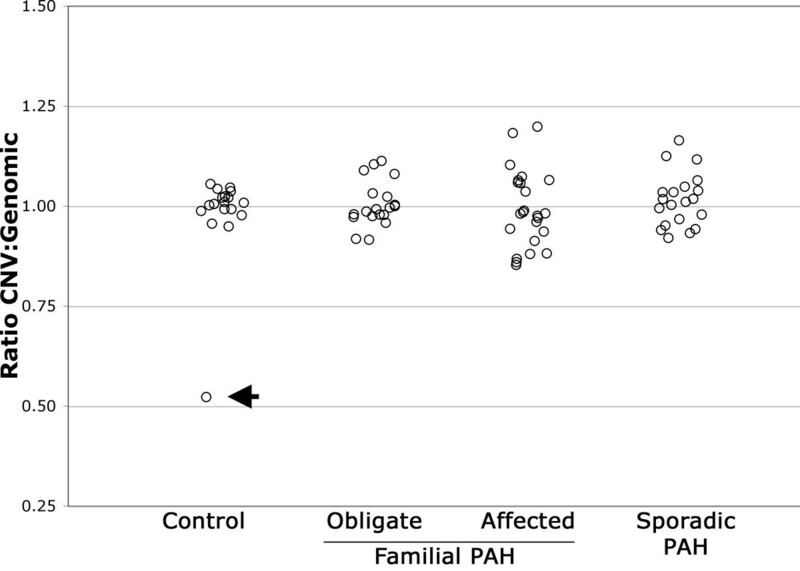 There were 21 families with familial PAH included, representing on average 113 BMPR2 alleles. In efforts to evaluate penetrance and anticipation, we included seven parent-child dyads. 93 patients were Caucasian and 4 patients were African American. DNA samples were diluted to 2 ng/ml. Quantitative PCR with SYBR Green was performed to quantify genomic copies of CNV and controls. Samples were run in triplicates on an Applied Biosystems StepOnePlus machine. A dilution series was performed to quantify primer efficiency. CNV in BMPR2 was present in one out of 97 samples. The CNV was in an African American control and consisted of a loss of one copy of the CNV region. Figure 2 represents the ratio of CNV to genomic DNA in the control, obligate, familial, and sporadic patients. Small variation from a ratio of 1.0 is caused by noise inherent to the quantitative PCR process. Since the reported CNV from the HapMap Project contained individuals of European, Yoruba, Chinese, and Japanese ancestry, it is likely that the CNV in BMPR2 in our patient is attributable to an ethnic basis. Ratio of CNV to genomic DNA in the control, obligate, affected, and sporadic PAH patients. The recent discovery of differences in levels of BMPR2 allele transcript among affected PAH patients and unaffected carriers led us to look for a CNV within the BMPR2 gene which could affect gene expression. We succeeded in identifying CNV in BMPR2 in intron 1 in one patient; however, the patient was a control subject. It is unlikely that CNV within BMPR2 intron 1 plays a role in the pathogenesis of either familial or sporadic PAH. JJ drafted the manuscript and performed quantitative PCR, CV participated in the design of the study, JC participated in the design of the study, JL participated in the design of the study, JW participated in the design of the study and performed the statistical analysis. All authors read and approved the final manuscript.